After its debut in early August 1993 — twenty years ago — the Newton was widely derided as a flawed machine that no one wanted. The Simpsons made fun of its handwriting-recognition software, as did Gary Trudeau with a Doonesbury gag. In Trudeau’s cartoon world, the Newton recognized “Catching on?” as “Egg Freckles?” — and the die was cast. The piece features some regulars in the Newton family, like Grant Hutchinson and Steve Capps. You get a sense of the Newton’s continued usefulness from the story, like Ron Parker using his MessagePad on the hiking trails around Lake Tahoe. Posted by davelawrence8 at 7:48 am on August 6th, 2013. One comment... » Categories: newton history. Tags: anniversary, messagepad, newton, splorp, wired. Subscribe via RSS. 2001 wasn’t all that long ago. Thanks to Google’s month-long anniversary project, we get to explore what the web was like seven years in the past. Head over to Google (with an exclamation point!) as it was in 2001, and you can search the web as it was then. The results shown are pretty remarkable, considering the iMac G3 was the newest consumer Mac available, the iPod hadn’t been released yet (not until September of that year), and we had a brand new president. Google provides archived versions of web sites, which allows us Newton users to explore some of the long-gone Newt web resources. The Newton Source, above, is now a link squatting site. But back in the day, I’m sure it was a pretty handy resource for MessagePad software. 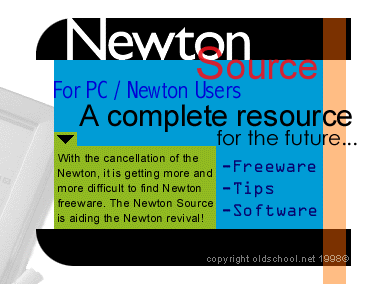 During my Newton links project, I’ve found so many sites that have disappeared. But thanks to Google’s 10-year anniversary search site, I can dig back in time and find out what the Newt web looked like only four years after development stopped. Posted by davelawrence8 at 11:30 am on October 15th, 2008. No comments... » Categories: community, newton history. Tags: 2001, anniversary, archive, google, internet, messagepad, newton, search, sites, web. Subscribe via RSS. 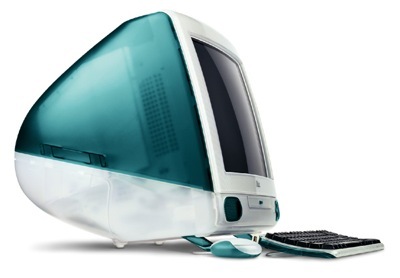 This week marks the tenth anniversary of the Apple iMac. I’m lucky enough to own one of the Bondi Blue beauties; it’s mostly my finance and gaming (WarCraft II) machine. I like to mess around with Photoshop on it, and I also got a copy of Adobe’s proto-web WYSIWYG editor PageMill to play with. I’ve got mine running OS 9, but they originally shipped with OS 8, I think. It’s my truly “classic” machine, and also my Newton MessagePad hub. It still runs like a dream, humming along at 233 MHz with 160k of RAM. So thanks, Steve Jobs, and thanks, Jon Ive, for bringing such a wonderful machine into being. Posted by davelawrence8 at 7:17 pm on May 7th, 2008. No comments... » Categories: apple, lowend, macs. Tags: 10, anniversary, apple, imac, jonathan ive, mac, macintosh, newton, OS 9, steve jobs. Subscribe via RSS.